Hi crafters! Monica here sharing my next October project for Joy Clair stamps and I am proud to say I am using this awesome stamp set called "Away in the Manager" a beautiful stamp set for Bible Journaling and Joy Clair has the "Color by Faith" group on Facebook so be sure to check it out. Christmas! MY favorite holiday for sure is right around the corner and this set is perfect for those Christmas cards. Although here in Florida lately it seems to be 80 degrees on Christmas day so it does not quite feel Christmaseeee..
On to the card I made. 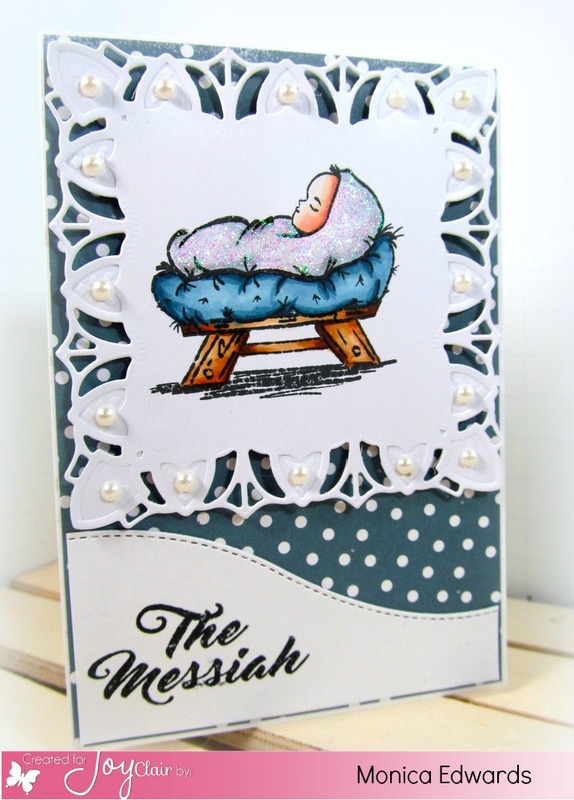 I stamped the image on X-Press IT paper and used a die from Spellbinders as well as Gina's Design dies for the card front. I added some Stickles to the baby cover to brighten it up. I colored the image with Copics and used Memento ink in black to stamp the image onto the paper. 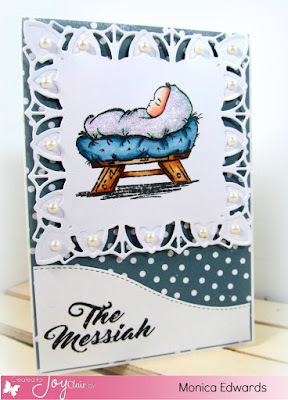 I stamped the sentiment on a sort of snow bank die and used it for the bottom portion of the card. Here is a closer look of the card. I hope everyone enjoyed my post for today and thanks for stopping by. Below you will find all the links where you can see more inspiration from the Joy Clair design team. Happy Holiday!! !